Teltonika FM 1202 does almost everything that you usually want a GPS tracking system to do, that too at a reasonable cost. Internal GPS & GSM antennas make it easy for those who wish to covertly track their drivers without their knowledge. Besides, the high sensitivity capability of the receivers enable FM 1202 to have a better reception comparing with devices that comes under the same category/price tag. FM 1202, an upgraded version of FM 1200 is blended pretty well for GPS tracking applications that fetch continuous data for real time location updates (even for a 5 sec update interval). 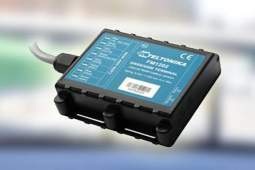 With additional inputs & outputs, FM 1202 model makes it easy enough to monitor and control external devices, say for eg., temperature sensors used in reefers of FMCG carriers. This device has a USB port for device status log output & entering configuration. Teltonika FM 1202 is one of the rarest of its kind with a digital input exclusively reserved for ignition status to nullify the negative impact (showing un-occurred idling events) caused by certain GPS devices in the past.